The Reese River Valley Scenic Drive is a spectacular sixty five-mile drive through remote valleys surrounded by towering mountains in Central Nevada. The route also goes through the historic town of Ione, passes nearby the Berlin-Ichthyosaur State Park and is the best route to use to access the high-altitude trailheads that lead into the Arc Dome Wilderness of the Toiyabe Mountains. The Reese River Valley Scenic Drive runs between the town of Gabbs on Highway 361 and the town of Austin on US Highway 50. The drive follows Nevada State Highway 844 and State Highway 21. The road is paved for the first ten miles to the east of Gabbs on Highway 844 and then turns to gravel for the rest of the drive to Austin. However, the gravel portion of the road is wide, relatively smooth and in overall good condition. Only during severe weather events will travelers have difficulty driving the gravel portions of the drive. The Reese River Valley Scenic Drive, despite its name, passes through two beautiful and remote valleys, the Ione Valley and the Reese River Valley. Both of these valleys are large, flat and sprawling and offer superb views of the looming Toiyabe Mountains and the Shoshone Mountains. In-between these two valleys, the traveler will cross a pass in the Shoshone Mountains called Ione Summit. Beginning just north of Gabbs at the junction of Nevada State Highway 361 and Highway 844, the Reese River Valley Scenic drive first begins a relatively steep ascent into the Paradise Range. As the drive gains elevation, the arid hills give way to forested slopes and wonderful views of the Ione Valley and distant mountain ranges. From the top of the Paradise Range, the Reese River Valley Scenic Drive drops down into the sprawling Ione Valley. This valley is deceptively large, a deception helped by the high altitude and usually crystal-clear air. The Shoshone Mountains rise steeply off the Ione Valley floor while the snow-covered peaks of the Toiyabe Range rise behind them in the distance. As the drive crosses the Ione Valley, the road switches from a paved surface to an all-weather gravel surface. Although the road is gravel, the road is usually in great condition. Other than the usual “washboards” that can appear on gravel roads, the only real hazard a traveler will encounter will be dusty conditions. Once the drive reaches the base of the Shoshone Mountains, the traveler can take a short two-mile side trip to Berlin-Ichthyosaur State Park, a preserved Nevada ghost town. Travelers can take a tour of an old mine and roam about on a self-guided tour that describes the various buildings and artifacts that remain at the Berlin townsite. Six miles later, the Reese River Valley Scenic Drive passes through the ghost town of Ione, where many old buildings still stand. After passing through Ione, the drive then begins the climb up to Ione Summit – a pass in the Shoshone Mountains. From the Ione Summit, the traveler has superb views of the Ione Valley, the Reese River Valley and the usually snow-covered Toiyabe Range. From Ione Summit, the drive drops down into the huge Reese River Valley where Highway 844 ends at the junction with Highway 21. The route then turns north on Highway 21 and travels through the entire length of the Reese River Valley. This section of the drive is beautiful, as the Shoshone Mountains rise steeply off the western edge of the valley while the Toiyabe Mountains rise abruptly off the eastern edge of the valley. The drive ends nine miles from the town of Austin, at the junction with Nevada State Highway 722 (which is also the Desatoya Mountains Scenic Drive). The town of Austin is well worth visiting, as the town is historic and the views from Stokes Castle are excellent. Austin also has several small hotels, two restaurants and a gas station for those in need of supplies or services. Traffic on the Reese River Valley Scenic Drive is light to non-existent. About the only traffic encountered will be individuals who are either taking this enjoyable drive or who are heading out into the mountains. 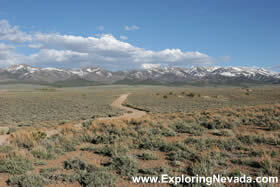 Overall, the Reese River Valley Scenic Drive is one of the nicest drives in Nevada. Anyone who might be driving down US Highway 50 between Fallon and Austin should consider building time into their schedule in order to take this very beautiful detour. Trip Length : 65 miles, one-way. Starts just north of Gabbs at the State Highway 844/361 junction. Drive follows Highway 844 and Highway 21 to the junction with Highway 722, nine miles outside of Austin. Road Type - The road is paved for the first ten miles outside of Gabbs, then turns to good condition gravel. The gravel portion of the drive should pose no problems except during severe weather events or the winter. Services Available - Gas and supplies can be found in Austin. There is no place to buy supplies or gas on the scenic drive. General Location - Central Nevada, to the southeast of Austin and to the east of Gabbs. Drive follows Nevada State Highways 844 and Highway 21. 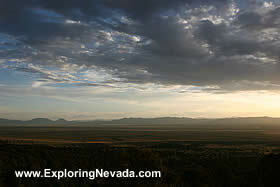 Camping - For most of the drives length, the road passes through BLM and National Forest Lands. Thus, primitive camping can be done anywhere. Developed camping is available in Berlin-Ichthyosaur State Park. Additionally, developed camping can be found in the Toiyabe Mountains by following a side road that leads to Columbine campground. 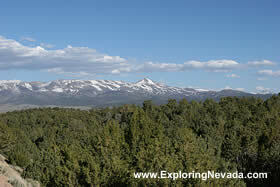 A Nevada topographic map book is needed find and follow the road that leads to this campground. Bring your tent or camper, as there is no lodging or services of any kind on this scenic drive. However, the town of Austin - which is just a few miles from the eastern start point of the Reese River Valley Scenic Drive - does have a few small motels.